Exhibition Of Paintings By Sripathi is an event that took place between 10-May-2006 and 20-May-2006 in Hyderabad. An ensemble of gold, precious stones and paint. Welcome to P. Sripathi's world of Tanjore art. 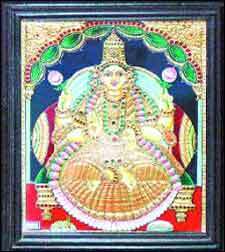 The artist will display his Tanjore paintings featuring Hindu gods and goddesses, at Chitramayee. Sripathi is a Rashtrapati Award winner in Tanjore gold leaf painting. He has travelled with his talent to countries like Russia and Japan. The exhibition will be inaugurated by D Subramaniam (Chairman AP State Cultural Council). Please contact 3091-3922/2311-3308 for further details. Be the first to comment on Exhibition Of Paintings By Sripathi! Just use the simple form below. fullhyd.com has 700,000+ monthly visits. Tell Hyderabad what you feel about Exhibition Of Paintings By Sripathi!